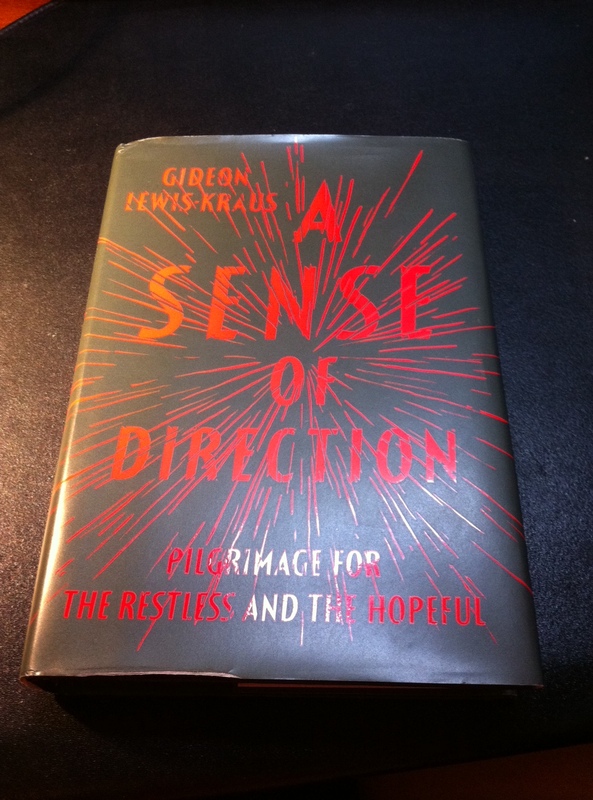 Gideon Lewis-Kraus’s book, A Sense of Direction: Pilgrimage for the Restless and the Hopeful, is meant to take you on a journey, both literally and figuratively. In this memoir, the author himself is on a journey of self-discovery and takes the reader along with him on what turns out to be quite a ride. Lewis-Kraus paints a picture of himself at the beginning of the book as a person who is rootless and unsure of where he wants to go with his life. He’s young, he’s flexible, and he has a career, writing, that can take him anywhere in the world. Beginnings like this, particularly when the author is young (nearing thirty as he writes), have the potential to reek of self-pity and extreme overindulgence. When I started, I was concerned that it would be like the first fifty or so pages of Eat, Pray, Love, in which the author reveals herself to be selfish and self-indulgent enough to walk away from a marriage to “find herself.” Throughout Eat, Pray, Love, I was annoyed with the character (so ably played by Julia Roberts in the movie, though – this was a case where the book was better than the move) for neither considering nor mentioning anyone but herself at any point of the journey. But Lewis-Kraus has taken a completely different approach to the journey novel than Elizabeth Gilbert since his narrative is inclusive, rather than exclusive of others, most notably his family, most of whom he clearly adores. The book begins with Lewis-Kraus living with his younger brother, Micah, in San Francisco since Micah has a great job and a nice apartment. He flounders around there for a while, then decides to move to Germany to the art scene in Berlin. Here the book does get a little indulgent with descriptions of parties, drinking and other incriminating behaviors. But then everything takes a turn to the left as Lewis-Kraus and his friend decide to take a walking pilgrimage through Spain. Lewis-Kraus is a master descriptor. His visions of color, sensation and feeling really come alive. When he talks about the people he meets on the month-long journey, he introduces them with a finesse and insight that make the people walk right off the page. After the journey through Spain, Lewis-Kraus spends a bit more time with Micah before trying a different, more difficult type of pilgrimage in Japan on the Island of Shikoku. This trek is harder both mentally and physically and the tone of the chapters takes on a more menacing feel. The author isn’t mean, just brutally honest. Throughout the book, one of Lewis-Kraus’s main struggles is with his relationship with his father, and so for the final pilgrimage of the book, he invites his father to take a trip with him to the Ukraine at the Jewish New Year where annually, a huge group of Orthodox Jewish men from around the world go to purify themselves for the coming year. His brother goes with them, and the three men learn a lot with and from each other on the trip. When Lewis-Kraus relays dialogue, the voice is snappy and somewhat theoretical. In various portions of the book, he lapses into his own thoughts in a very academic way that shows him to be a thinker as well as a do-er. He has rational discussions of the idea of expiation of sin. He goes into great detail about the physical and social idea of a community. He explores the social psychologist Wittgenstein along with the famous Lubavitcher Rebbe Nachman as they relate to various parts of his journey – in the physical and emotional realms. However, just when you think you cannot take a moment more of his theorizing, he puts in a completely inane comment that relaxes the scenario and lets the reader know that he doesn’t take himself too seriously. A reader doesn’t have to be on an actual journey to appreciate this book. It helps, though, if you can imagine your own life as a personal journey and relate to the idea of self-exploration as a positive trait that exists beyond mere navel-gazing, going toward true discovery. The end made me cry in a beautiful way.